Passion for his footy. Check. 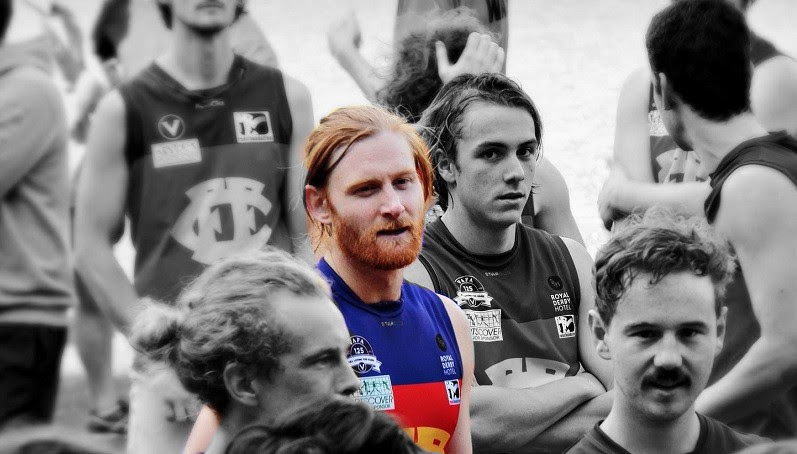 Jack Atkinson ticks every single box for all things Fitzroy. On Saturday, the Reserves’ captain will run out for his 150th game for the club. A long-time defender, “Atko” has risen to become one of the club’s most respected blokes and his hard work and effort over many years has resulted in his appointment to skipper for season 2017. Atko has grown into one of the first blokes picked in the twos each week after several seasons split between the Reserves and Thirds. A hard worker on the track, 2016 coach Sam Buckley told “Atty” that he would remain in the side for several weeks regardless of form, giving him the confidence to attack the game without worrying about selection. And it worked. Atko had a stand-out 2016, taking his form into this year. Buckley, who is also a former teammate, says Atko is a pleasure to coach. “He absolutely gives his all for the jumper and has improved as a player year-on-year for the last five years,” Bucks says. High school buddy and fellow defender, Jono Anderson, says he has a huge amount of love and respect for Atko. 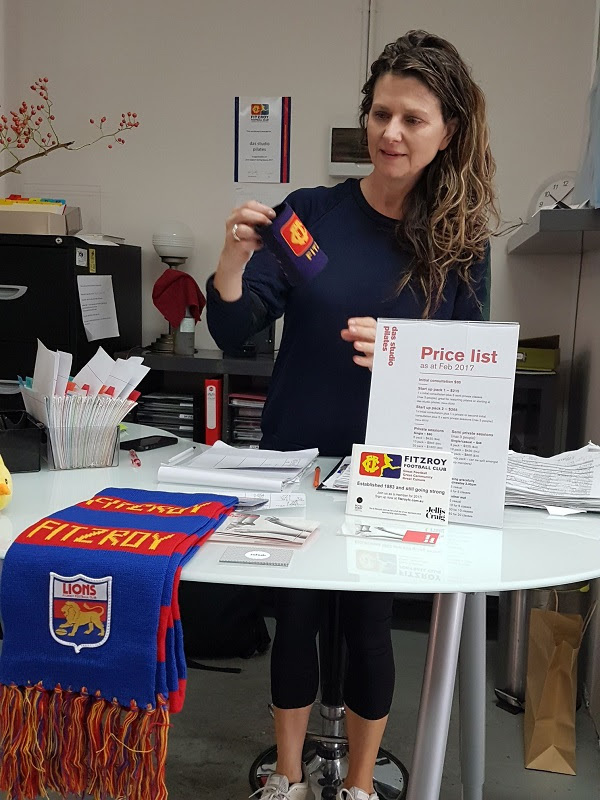 It’s a big weekend for women’s footy at Fitzroy with the annual Women in Footy lunch on Saturday at BSO and Fitzroy-ACU Women 1 taking on Old Xaverians at Xavier College on Sunday. The Roy Girls are nicely placed for a finals berth in the VAFA’s first year of women’s footy. They sit in second place on the ladder, just one win behind SKOB Saints and one in front of Marcellin. Such is the closeness of the competition they cannot afford to drop a game. The last time the teams met at Ramsden Street in round 6, Fitzroy scored a massive 85-point win, with Annabel Watson kicking four goals. Last week’s home win against Melbourne Uni was just as comprehensive; 9.13.67 to 0.2.2. Alexa Madden and Tash Ross-Harris, fresh from her star turn with the Big-V, were the best players. Last week’s goals were shared around with two each to Tasha Kroussov, Lauren Carlin and Hillary Grubb. 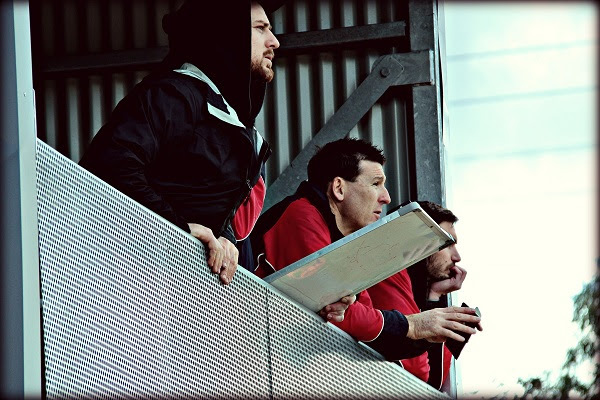 It will be the final game under Lauchlan Dalgleish, who has been doing an outstanding job as stand in coach for Mick Symons, who returns from overseas next week. If you get a chance, head over to Xavier College at 12pm on Sunday and take a look at the Women’s 1 team in action in a rare Sunday game. This is the second last round before the women’s finals start on 5 August. It was a case of oh so close for the Fitzroy-ACU Women 2 team on Saturday with a three-point loss to local rivals, the Brunswick Renegades. Leading at half time, 2.5.17 to 1.4.10, the Roy Girls just could not find a way to score in the second half and went down narrowly despite a very strong effort. Bridie Murphhy was best for the Roys, with Madeline Hogan and Tess McDonald the goal kickers. The close game will give them plenty of momentum as they face Canterbury tomorrow, who sit one above them on the ladder. It’s been a lightning-fast journey to 100 games for long-time Royboy Nathan “Liga” Ligris. The 22-year-old midfielder will reach the milestone this week at Brunswick Street Oval against Mazenod. 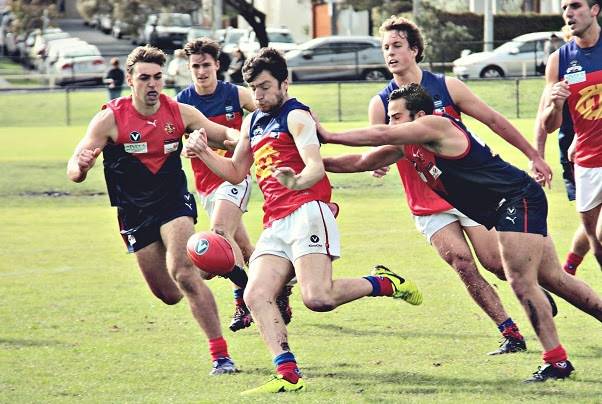 Liga debuted with Fitzroy Football Club in the Under 19s in 2012, after playing 63 games with the Fitzroy Junior Football Club. Both Fitzroy coach Nick Mitchell and captain Rory Angiolella agree that Nathan has racked up his 100 games quicker than most footballers. Nick thinks Nathan’s biggest achievement in football so far is the consistency of his performance so early in his playing days. e has barely missed a game in the last six years, and the last three years have been in the senior side since graduating from the Under 19s,” he says. Rory is similarly impressed by what Nathan has accomplished already. “His biggest achievement has been consolidating himself as a really integral part of not only the senior side, but the wider football club at such a young age,” he says. Nick says that Nathan is “very coachable.” “Watching him grow from a quiet, skinny kid with ability, to a confident, resilient footballer who is still improving week to week with no ceiling evident has been an enjoyable experience,” Nick says. Rory says that Nathan is respected for his dedication to the club. "He's always on time to training, he always puts in on the track, he comes to all the functions and is always willing to put his hand up to chip in, which is really important at a club like ours." The club captain says he also enjoys catching snippets of Nathan's "sledging talents" on the field. "He's quite often trash talking and I always get a laugh when I hear what he is saying," Rory says. Nick and Rory both have messages for Liga on reaching 100 games. Nick and Rory emphatically agree that Liga should have no worries reaching his next milestone. "I think he’s got at least 200 left in him if that’s what he desires," Nick says. 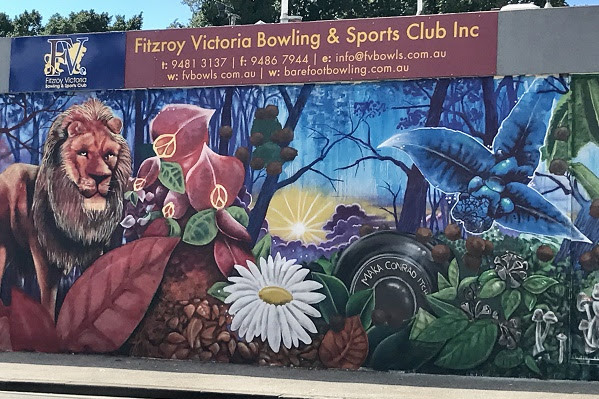 Playing the main game at Brunswick Street Oval certainly suited the Fitzroy Thirds, which scored one of the biggest wins in the club’s history on Saturday and now sits nicely in the top four. The win over bottom placed Parkdale Vultures resulted in an incredible 37.27.249 to 1.2.8 scoreline, with dual spearheads, Tim Denatris and Simon Heather kicking seven goals each. Milos Zika, Ben Frazer, Keith Dimech and Owain Dunn were in danger of suffering from leather poisoning by the end of the day. This weekend’s game against De La Salle, who sit a couple of games ahead of Fitzroy in third position on the ladder, will prove a far tougher test. With the promise of finals on the horizon, the Thirds have been training the house down and coach Trent Coleman is building the momentum nicely. Fitzroy’s U19 (2) team finally broke through for their first win of the season last Friday night out at La Trobe University, with the win also moving them off the bottom rung of the ladder. And it was a big win too, defeating the home side 13.21.99 to 4.3.27. The core playing group was reinforced by a motley crew of some regular U19 1s doubling up and some current and past Fitzroy juniors who answered the call to help out with numbers. James Ziemkiewicz was best on ground and also kicked three goals. Tane Buchanan also chimed in with three. It may have been a happy hunting ground for coach Nick Mitchell in his playing days, but his former club didn’t do him any favours on field last Saturday. 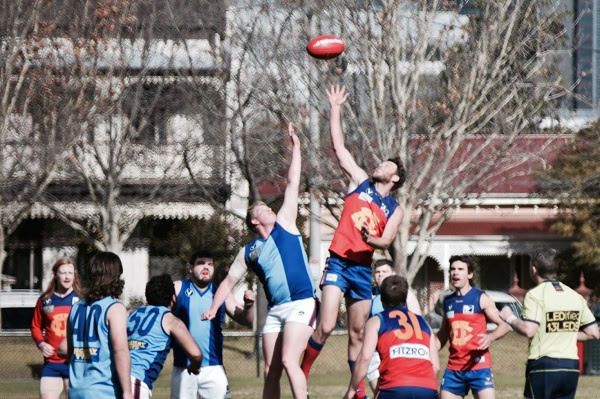 The Snow Dogs flexed their collective muscle and have now put Fitzroy in danger of relegation with a thumping 129-point win. It was the 15-year reunion for the St Bernard’s 2002 premiership team, captained by Nick Mitchell, and the home side celebrated, defeating Fitzroy 26.15.171 to 5.12.42. Aiden Lambert and Ross Borland worked hard all day with Fitzroy on the back foot right from the start, after an 8 goal first quarter from the Snow Dogs. It wasn’t a whole lot better for the Reserves, who also went down 21.12.138 to 11.3.69. It was a very promising return from key forward Corbin Stevic who kicked six of Fitzroy’s goals. The Reserves sit on equal sixth spot, two wins and percentage out of the four. Fitzroy faces Mazenod at home tomorrow and it’s a game we must win. The team sits in eight place on the ladder, one game ahead of Parkdale, and with everything to play for to stay in Premier B in 2018. Go Roys! A huge thank you to Women 2 Captain Michelle Booth who was the driving force behind Saturday’s successful Reds Ball at the Melbourne Zoo. Special thanks also to Tom Cheshire for co-organising and ensuring the high quality music and so many players in attendance, and to Louise Maniatakis for keeping track of all the numbers and names. 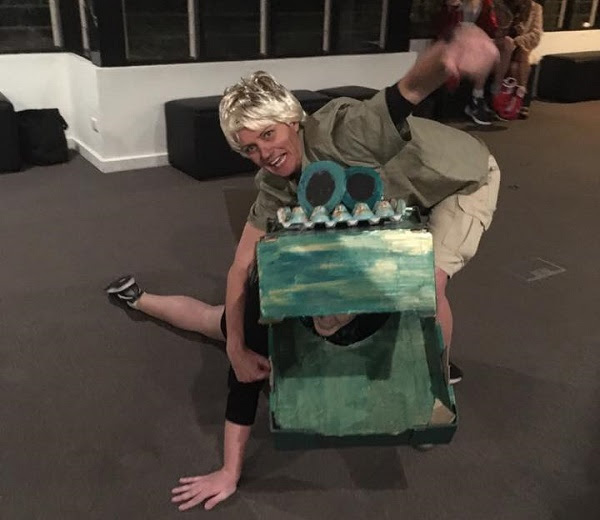 Well over 100 players and friends of Fitzroy attended the function at the Zoo and the costume effort once again was a highlight. Best dressed for the Fitzroy-ACU Women was Lydia Hobden, fabulously ensconced in a full cardboard crocodile body suit, painted green, egg cartons for scales – amazing. For the men, it was a dead heat; we couldn’t split Nathan Ligris as Dora the Explorer and Tim Denatris as The Supreme Jungle Adventurer. Honourable mentions to the whole Irwin Family, Poison Ivy, Rafiki the wise from Lion King, Axel Rose and crew from Welcome to the Jungle, and Rumble in the Jungle protagonists, Mohammed Ali and George Foreman. The cost of only $5 per person includes coaching, bowls competition, BBQ lunch, tea and coffee. Drinks will be available at the bar, and participants can pay their entry cost on the day. Are you our 2017 winner? 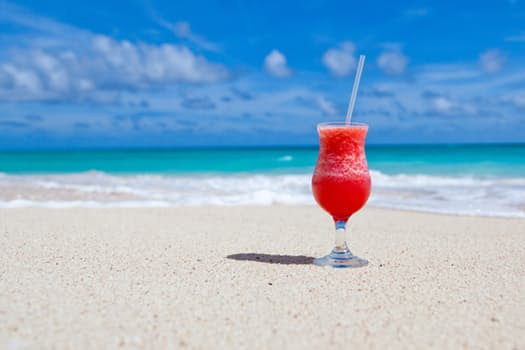 For those who have not purchased their raffle tickets, don’t miss out on a $3000 travel voucher, AFL finals series tickets or $500 worth of petrol. These are the fantastic prizes up for grabs at just $10 a ticket. This Saturday is the final BSO home game prior to the draw on 12 August, so you have just two more chances to go into the running. Tickets must be purchased by 5 August 2017 and they will be drawn at 6pm on 12 August 2017 in the Community Rooms at Brunswick Street Oval during the post-match presentation after Fitzroy takes on Old Carey. To all of our players, who have been doing a great job selling tickets, please get your sold books and money back to the club ASAP. You can bring them to games or training and hand them to one of the club Directors. Please put your name on the front cover of the raffle booklet. If you’re looking for exercise that promotes fitness and strength, in a studio carrying the very Fitzroy smells of coffee and Aesop products, there’s only one place to go. das Studios pilates on Smith Street, a Fitzroy sponsor, is offering members of the FFC community a special deal to get fit and improve flexibility and strength. Fitzroy supporters can access a 20% discount on either of the start-up packages that das Studio offers, until 31 December this year. You may even end up practicing pilates alongside a Fitzroy player, as players from all levels of the club have been visiting das Studio this year. If you’d like to try out pilates at das, contact Helen on 0412 503 771.